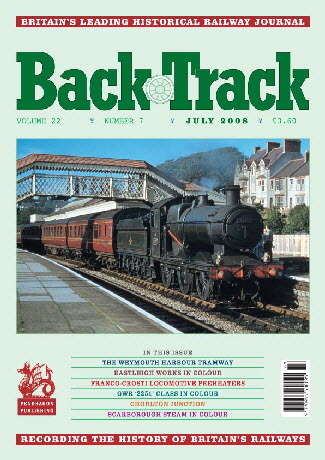 BackTrack July 2008 journal from Pendragon Publishing. North East Coast and Hills - a 1 970s colour photographic exploration by Geoffrey Skelsey. Sparks: The Electrical Consultants - Part One - The Groundbreakers - R. A. S. Hennessey looks at some pioneers of electric traction. A Midland Electric Centenary - colour photos of the Lancaster-Morecambe-Heysham electrics. Attilio Franco, Piero Crosti and Locomotive Preheaters - David Alexander reviews the work of two Italian engineers, best remembers in Britain for the 'Crosti 9F' 2-10-0s. The Weymouth Harbour Tramway - by John D. Flann. To Scarborough by the Sea - three colour pages of steam at Scarborough. At Eastleigh Works - four pages of colour photos by Roy Hobbs of locomotives in and out of the workshops. Auchtermuchty and the Fife & Kinross Railway - Part Two of Alistair F. Nisbet's branch line history. The GWR '2251' Class - two-page colour feature of the useful 0-6-0s. Chorlton Junction - Part One - E. M. Johnson describes a meeting point of the Midland and Great Central lines into Manchester. Southern Sunshine: Southern Style - Alan Bennett shows how the Southern Railway promoted holiday business in the 1920s/1930s. Fraud, Liquidation and Ingratitude: The Early Finances of the London Underground - Stephen Halliday probes the murky beginnings of the capital's underground railways. Remnants of the Mumbles Railway - Neil Taylor found some surviving features of this historic South Wales line to photograph in 2008.